Most users usually buy or rent movies/TV shows from iTunes store, you can’t play the iTunes downloaded videos on Google play via Android devices directly because of the DRM protection. 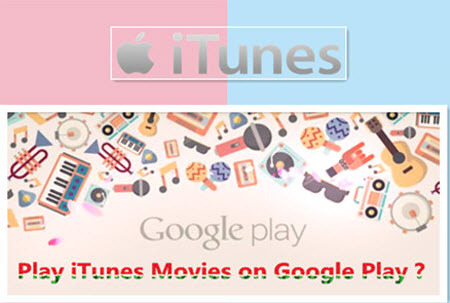 Learn >> Main Differences between iTunes and Google Play. Is there any other solution that Android users can buy iTunes movies and watch the movies on Android devices or import the iTunes movies to Google Play? We have to find a 3rd party DRM removal software to remove the annoying DRM protection. Google Play will smartly combine all of Google’s other stores like the Android Market and Google Music into one cloud-based marketplace for all media needs. Just like iTunes, Google Play will be consumers’ one-stop shop for movies, games, music, apps, and more. That’s why Google play comes out. The movies you buy or rent on Google play is so cheap as the same in iTunes movie store. But to my opinion, the movie quality is much better in iTunes store, epecially Apple promotes the iTunes extras free nowadays. Learn >> iTunes to DVD | iTunes movies to Samsung Z1 Tizen | iTunes Music Video to WMP…. Maybe the conclusion is that Google play is still the best movie store choice for Android users, and iTunes store is the best movie store for iOS users. As we all know, Apple makes its content so proprietary. It won’t allow consumers to transfer their paid content to Android devices or Google play service. And it won’t provide service for Android users as Google did for iOS users. Apple’s Fairplay DRM protection is the only block for us to transfer iTunes purchased movies to Google play. So we have to find a Fairplay DRM Removal application at first. Here, Pavtube ChewTune is a strongly recommended aplication for converting iTunes DRMed videos to Google Play video formats. In this article, we want to introduce detailed steps on how to transfer iTunes movies to Google Play for Any Android deivces. The Mac version is ChewTune for Mac. 2.Allow the audio driver installed during the Pavtube ChewTune installation. 3.Close iTunes before running the Pavtube DRM Removal Converter when converting iTunes M4V movies. Step 2. 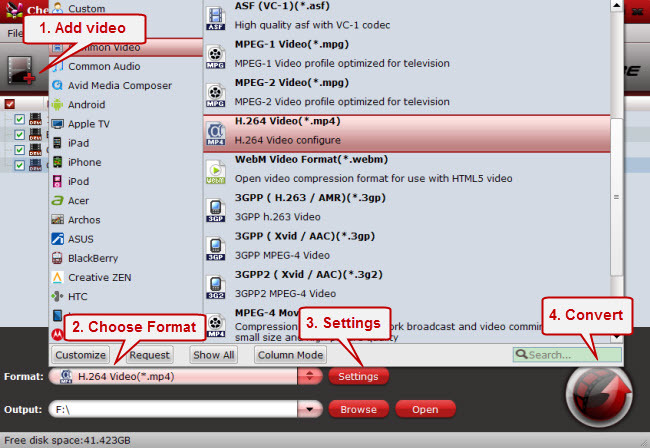 From “Format” drop-down list, choose “Common Video > H.264 Video(*.mp4)” as the output format. Or you can also specify search formats which works on your Android devices too. Step 3. Click the big “Convert” button on software main UI to start iTunes to Google Play conversion. After the conversion, click “Open output folder” to quick locate the converted video. Login your Google play account via Safari browser , locate at “My movies&TV” portion, then you are allowed to upload iTunes movies to Google play from your computer.